I don't normally talk politics here, but I was among the 39% who voted against Amendment One in North Carolina. It was a vote cast for progress, hope, and equality. We lost the battle. I am saddened that my home state was close-minded, and that I've witnessed many harsh words being flung from both sides. I wasn't going to post a recipe today, because it seemed trivial compared to other things. But I decided that there is good that comes from bad. The fight for equality is far from over. Just look at this amazing endorsement from the President yesterday. 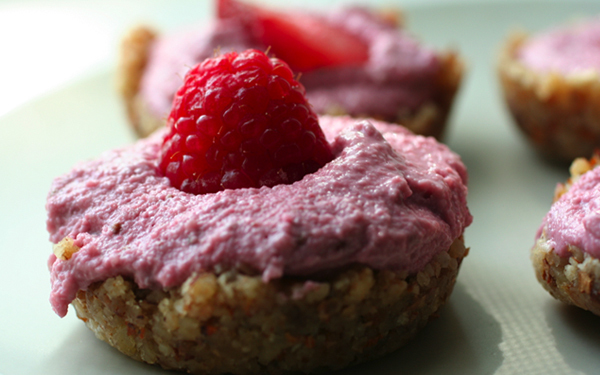 All of this reminded me of these raw strawberry tarts. Tarts that I made for a dear friend who has been fighting her own battles for months, the strongest and most beautiful person I know. She finished her last round of chemo recently. And that made me smile. Here's to perseverance. Line a 12-muffin tin with plastic wrap. Put all the ingredients for the crust in a food processor. Pulse until combined and sticky. Add about two tablespoons of crust into each muffin cup, pressing into the bottom and a little up the sides. Add the filling ingredients to the food processor (or Vita-Mix). Process until smooth, creamy, and very pink. Pour about two tablespoons into each muffin, right on top of the crust. Garnish with slices of strawberry or a single raspberry. Place in the freezer to set. This will take about 4 hours. Let set at room temperature 10-15 minutes before eating. Perfect for those hot and humid days or for anyone looking for a light dessert. yes - I'm mostly saddened by the hatred flung about as both "sides" try and make a point. And how brave, for a politician in this day and age, to show us we can change our minds and that's a GOOD thing! I should comment here more...I do love your recipes! These look absolutely delicious! i've been loving your delicious recipes for a while now. but this may be my first comment. i live in virginia and recently saw a documentary on the ban on interracial marriage (the loving story). it saddens me that we don't understand that this is the same fight for equality for all. but it's time dust off, get up and keep fighting for everyone to be seen as equal in the eyes of the law. 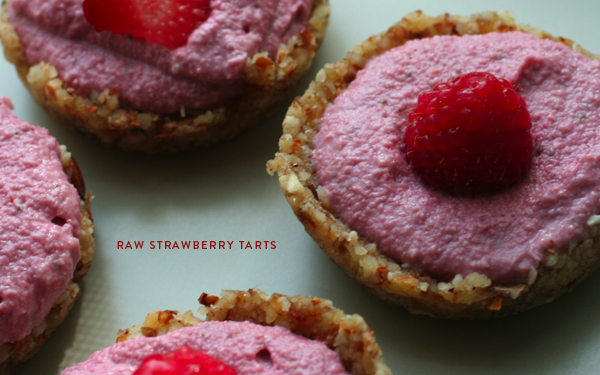 thanks for posting the raw strawberry tarts recipe anyway, i've already pinned them and plan to make them in two weeks for a get together with some friends! yum! these look insane. want. Adrienne, my heart was warmed when I saw your tweet yesterday, standing up for equality in your home state where the vote passed. You've written such a beautiful and encouraging post here today. These look delicious! I wish the best to your friend, that is a difficult thing to go through. And as you said, one day at a time. Tomorrow will be better (in everything, hopefully politics as well!). Thanks for your encouraging words, friends! I love how you put the strawberry on top. You put it on top in such a cute way.